- 20 stops at the most attractive points of the City. - Hop on - Hop off. - Available audio in 10 languages. 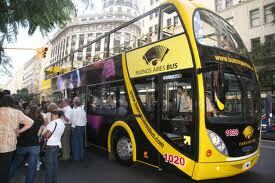 - Information guide of Buenos Aires. - Tourism guide on board. Telephone: From Buenos Aires: 5239-5160. From Abroad: (54 11)5239-5160.